Graham Turner's large scale medieval battlescenes are well known for their realism and attention to detail. Very little 14th and 15th century armour survives, so the appearance of the armour worn during the Hundred Years War and Wars of the Roses must be gleaned from other sources, such as the memorial effigies and brasses that can be found in churches all over the country. 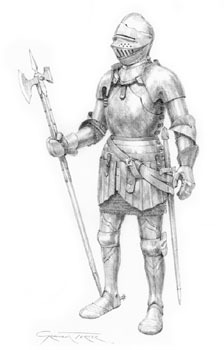 Graham Turner's pencil drawings bring these effigies to life in incredible detail, and show what a knight or man at arms from this period would have looked like. Each is unique, and those that are currently available are detailed below. 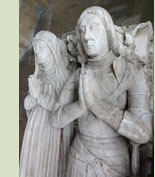 Based on the tomb effigy of Sir William Ryther at All Saints church in Ryther, Yorkshire. This is typical of English armours of c.1475, with the distinctive cusped edges and some fluted surfaces, but closer examination reveals many subtle differences to other, similar tomb effigies that make this a very individual armour. Sir Walter Hungerford (1378-1449) was a leading figure during the early 15th century, a member of Parliament and renowned warrior (later a Knight of the Garter). He accompanied Henry V on the Agincourt campaign with twenty men-at-arms and sixty archers, and is shown wearing armour befitting his rank, with a surcoat bearing his arms. Stitched to his chest is a small St. George's cross; Henry V's ordinances specified that this should be displayed by everyone in his army. 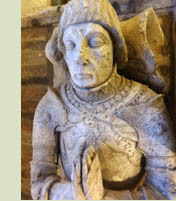 Graham Turner has based the armour on the tomb effigy of Sir William Wilcote, who died c.1411. 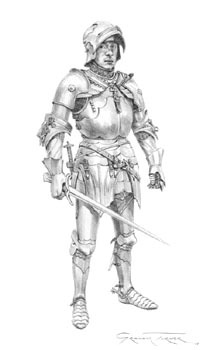 Early 16th century English armour has a great deal in common with the armour of the last quarter of the 15th century, with small changes reflecting current fashions, such as the rounded toes of the sabatons. The most obvious difference is the development of the close helm, this example being based on one that is in the Royal Armouries reserve collection. The armour is based on the tomb effigy of Edward Redman at Harewood in Yorkshire. A very distinctive English armour based primarily on the tomb effigy of Sir John Savile, at Thornhill in Yorkshire. 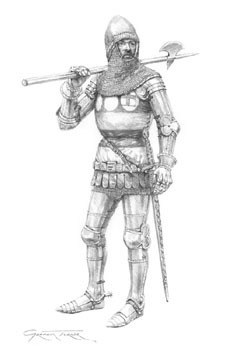 Sir John died in 1482 and his armour shows many of the characteristics of other English armours of the period, but with subtle differences in details such as the fluting and cusping, especially on the pauldrons (shoulders). He wears a Yorkist livery collar of suns and roses, showing his allegiance and standing with the Yorkist King Edward IV. Sir John Cornwall (1364-1443) was one of the most respected knights of his period, and a leading figure in the Agincourt campaign. 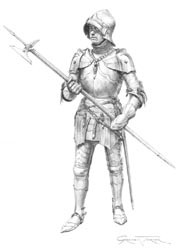 He is shown wearing armour of the late 14th/early 15th century, still retaining the bascinet with mail aventail, but with the later rounded visor. English armour from the time of the battle of Agincourt, showing the latest style of great bascinet, with plate defences for the throat and neck rather than the mail aventail of the 14th century bascinet. While offering greater protection, the great bascinet restricted any movement of the head, and both styles would be seen on the battlefields of the early 15th century. The armour is primarily based on the tomb effigy of Ralph Greene, at Lowick church, Northamptonshire (died 1417), and the very similar effigy of John de Vere, Earl of Oxford. The surcoat displays the heraldry of Thomas Montagu, Earl of Salisbury. English knight c.1434, based on the tomb effigy of John Fitzalan, Earl of Arundel, in the Fitzalan Chapel, Arundel. It exhibits many characteristics of English armour from this period, such as the great bascinet helmet and deep fauld protecting the loins with small tassets suspended from the lowest lame. Armours of this syle would have seen action during the later stages of the 100 Years War. Graham Turner's original paintings and drawings are offered for sale by the artist himself, rather than through Studio 88, which is our print publishing business. Consequently, payment directly to him is preferred. If you are interested in purchasing an original painting, please email Graham Turner at graham@studio88.co.uk to discuss the purchase or to arrange to visit. The cost of shipping original paintings varies, depending on their size, value and destination. Our usual shipping rates do not apply, but we would be happy to provide a quote for shipping to your address if you are unable to collect. CLICK HERE for more information about buying an original.